It’s hard for me to figure out a way to game it. You all are smart, tell me how to game it. The prize is maybe you get to game it. I’ve discussed some issues with the IEX platform. In this post, I’ll add detail for a few of those issues. And, while labeling an exchange “gameable” is subjective, IEX peg orders remind me of controversies from other markets. I haven’t seen IEX’s source code or system design, so this post is speculative. All orders sent to IEX go through the 350us “shoebox” delay, at the time of entry. However, the exchange does not apply the delay to algorithmic order types such as peg orders. This behavior is designed to prevent nefarious traders who, after seeing a quote change on another exchange, rapidly submit aggressive orders to IEX, hoping to hit an order pegged at the now-stale price. IEX’s intention is a good one. But, if the shoebox delay is not fine-tuned, there can be some undesirable side effects. Top panel: Average market-priced profit or loss per share vs distance in time from trade, from the perspective of the passive side of the trade. 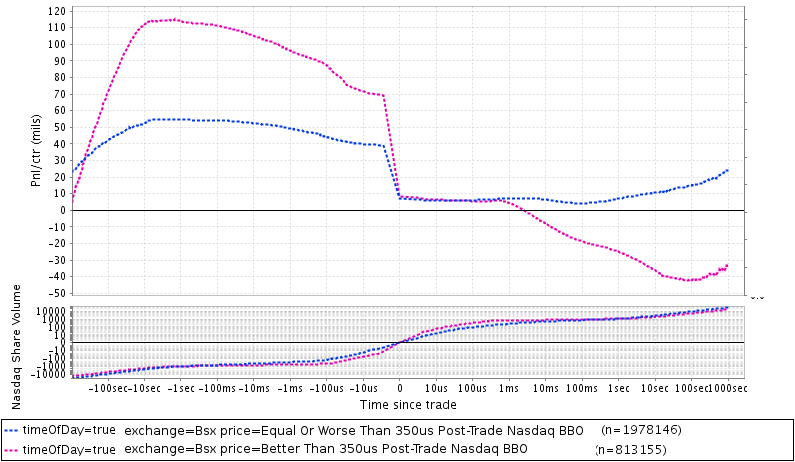 Trades are grouped by how their price compared to the (round lot) Nasdaq BBO, 350us post-trade. Roughly speaking, if Nasdaq were to pull its orders in similar circumstances as IEX pulls its peg orders, Nasdaq would prevent all the trades from the “Better than 350us Post-Trade Nasdaq BBO” group. The group that would remain (“Equal or Worse Than 350us Post-Trade Nasdaq BBO”) would be very profitable after receiving the ~30mil rebate. Visible execution only. The “market price” is the average price of the most recently traded 100 shares. Chart is over 8 days in August 2014 and excludes fees and rebates. Bottom panel: Shares traded on Nasdaq vs time from trade (including fiducial trade). Other, non-colocated exchanges (like BatsZ or EdgeX) that I checked are similar. These charts are just hints at the option-value offered by IEX and are closest in spirit to IEX primary peg orders, which (I think) only trade at the 350us ex-post NBBO. The edge that midpoint pegs and D-Pegs receive from the head start is much harder to estimate, but I expect that it’s sizable. Sophisticated traders might take advantage of the option-value offered by IEX by simply sending peg orders instead of normal, firm orders. If they’re fast enough to be the first peg orders received by IEX, the estimated 50mil edge could make losing strategies wildly profitable. A) IEX pegs are priced using other exchanges’ quotes. Peg orders that would have been unviable economically will now be profitable, through their use of information about the future state of those quotes. B) These peg orders will proliferate on IEX. C) Orders sent to IEX that would otherwise have been routed out to other exchanges will now trade with these proliferated peg orders. D) That will lead to fewer, more toxic fills for passive orders on every other exchange. E) Market makers may widen their quotes to compensate for this adverse selection. A) Aggressive traders may cause or predict the movement of prices on other exchanges. B) IEX will see these price movements, which occur *after* they receive aggressive orders, and pull posted peg orders which would have executed. This fading of liquidity could harm the same traders that Michael Lewis wanted to protect. C) Aggressive traders could send their orders to IEX 350us before sending orders to other exchanges, in the spirit of Thor. That would prevent IEX from using future information to pull peg orders. Delaying orders is not always an option though; if the aggressive trader is an execution algorithm reacting to a trade, it couldn’t afford to delay any of its orders. If it did, a competing execution algorithm (or HFT) might clear out the available liquidity. Thor-style delays may work for human traders, but are not helpful for the vast majority of volume executed by computers. Knowing exactly how these orders will behave, sophisticated traders can integrate them into their strategies more effectively than other users. I bet it’s profitable to simply copy quotes posted on other exchanges onto IEX with peg orders. IEX allows traders to mirror liquidity from other exchanges, without the risk of getting run-over that normally entails. And, most of this revenue will be earned by high-speed traders. When there’s a structural inefficiency like this one, the fastest orders capture the profit. A 50 mil per share edge is very enticing to HFTs, and I’d expect that many will soon be competing in a race to be first in the ‘peg order queue’ (if they aren’t already). Selective application of a speedbump is economically equivalent to an exchange distributing a secret data feed, providing anointed traders advance notice about changes in the order book. A simple system update would resolve this issue. IEX could keep its peg orders from executing at stale prices, without using information their counterparties don’t yet have. FX traders understand the consequences of interacting with last look liquidity, and can route their orders elsewhere. Equity markets are different. Maybe last look would tighten spreads for retail traders. But we should think hard before bringing it to our stock market. Nasdaq has set the NBBO of a stock, which is 10.00/10.01. IEX has a primary peg order on its bid, currently resting at 10.00. Somebody sends a large sell order to Nasdaq, clearing out the bid and leaving some quantity resting at 10.00. The new NBBO is 9.99/10.00. High-speed Trader A sees that and quickly sends an order to IEX to sell at 10.00. Mostly. D-Peg orders adjust their price in response to the number of quotes at the NBBO, 350us after reception of an incoming order. If you’re interested, the mechanics of the D-Peg are now disclosed. They’re on p210 of this pdf from IEX’s exchange application. The NBBO is different from the Nasdaq BBO. Adding in venues with inverted pricing (Bx,EdgeA,BatsY) should make this edge larger. Different exchanges and different order types have different populations of traders. A market data message takes time to get from Nasdaq to IEX’s system. The details may bore you, but IEX’s speed advantage will vary by exchange. Messages from Carteret to Weehawken on commodity fiber take about 180us 1-way. On a wireless network, messages from Carteret to IEX’s POP in Secaucus probably take about 90us. So HFTs may receive Nasdaq messages around 90us before IEX does, which means that IEX arguably has a 260us headstart (350us – 90us) for reacting to Nasdaq. For the 4 Bats exchanges in Secaucus, IEX will essentially have the full 350us head start. For the NYSE exchanges, IEX should have a smaller advantage. And IEX may receive market data from CHX (in Chicago) well after high-speed traders do, if any bother to send it wirelessly to NJ. There’s also nothing stopping IEX from getting its market data over wireless, which would give them the full head start for messages from every exchange, and would be a tiny expense by their standards. Let’s say that you have some multi-threaded software. The software processes a stream of two types of events, A and B. Sometimes, events of Type A occur slightly before those of Type B, but the Type A event processing tends to be slower. Because of that slowness, the software often finishes the Type B events first. That causes events to be handled out of order, and has bad consequences. Your measurements show that Type A’s processing is typically slower than Type B’s by 100us, but never more than 300us. So, you decide to delay all Type B events by 350us, because that will make sure they can never beat any Type A events which occurred first. You’re very proud of yourself, and tell your customers that their synchronization problems are over. If “Type A” events are NBBO changes that cause you to reprice peg orders, and “Type B” events are all other customer orders, then this analogy is close to the idea of exchange speedbumps. The problem, of course, is that now the “Type B” orders have a speed disadvantage, which means, if the price moves away shortly after they were received, that they can’t match with peg orders. There are methods to properly deal with these situations in software. It’s just that adding a constant delay to select events isn’t one of them. The NBBO for a stock is set by Nasdaq at 10.00/10.05. An HFT observes a hidden trade on Nasdaq at 10.03. The HFT knows that there is probably still hidden liquidity available at 10.03, because resting hidden orders tend to be large. The passive side of the hidden trade isn’t distributed in market data. 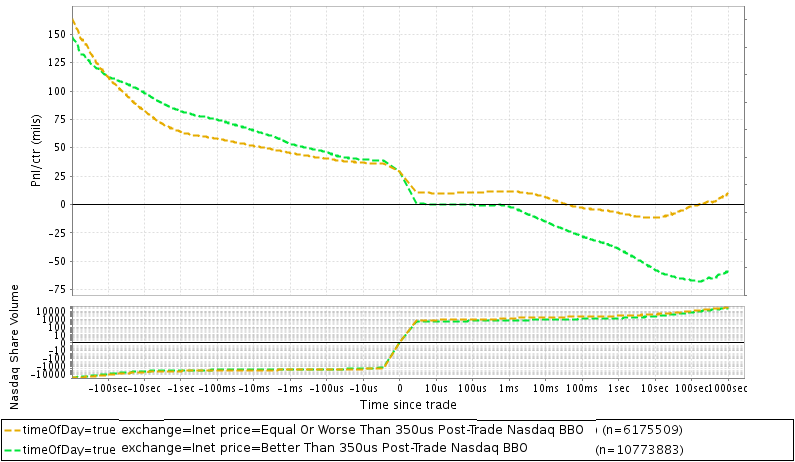 But the HFT has a model which estimates that there’s a 70% chance that the resting side is the bid. If the HFT were more confident about that estimate, it could submit a midpoint buy order to Bats, which could get filled at 10.025, lower than the price the hidden order just paid. However, the 30% chance that the estimate is wrong is too high — If somebody sends large sell orders checking for hidden liquidity at Bats, and shortly afterwards sweeps the Nasdaq bid, the HFT will be stuck with a toxic fill. The HFT submits a midpoint buy peg to IEX instead. Now, if their guess is wrong, they’re protected. When IEX receives the same aggressive order checking for hidden liquidity, it holds it for 350us. While holding onto that order, IEX sees the Nasdaq bid swept, and pulls the HFT’s midpoint order. If the HFT’s guess is right, and someone sends large sell orders to IEX and Nasdaq, the hidden order at Nasdaq will trade at 10.03, leaving the displayed bid intact. The HFT’s order will execute at IEX at 10.025, a better price than the hidden order received. In addition to peg orders backing away from fills after market conditions deteriorate, it’s possible that IEX uses non-delayed data to help peg orders aggressively trade against resting liquidity, potentially “picking off” orders on their own exchange. I previously blogged about this “book recheck” feature. “Book rechecks” could offer conditionality to sophisticated traders wanting to remove liquidity before specific future events. This entry was posted in Uncategorized on October 5, 2015 by Kipp Rogers. Thank you for taking the time to share all of that. A D-Peg order on IEX is always non displayed and hence will execute only after all displayed orders at the same price have been matched. So the grouping “Better than 350us Post-Trade Nasdaq BBO” is too large because it includes orders that have basically better priority in the book than the D-Peg orders can get and consequently are more profitable. I believe you’re right that all peg orders on IEX are non-displayed. And that is a mitigating factor; at least IEX doesn’t display quotes that they reprice in this manner. But all pegged interest on IEX should have this issue, not just D-Pegs. I believe that IEX automatically slides the price of aggressively priced hidden orders to the midpoint (and updates this slid price as the midpoint changes), so the issue probably affects a large portion of IEX’s hidden volume. Over 90% of IEX’s volume is dark in recent data ( http://iextrading.com/stats/#recent-stats-table ), so it’s not too unreasonable to neglect the displayed orders in estimating the magnitude of this effect. Regardless, the plots are mainly for illustrative purposes. They roughly show the performance difference between executions that would and would not have been prevented by this sort of behavior were other exchanges to do the same on their lit order books. It could be that dark (or mostly dark) order books behave differently. We can’t simulate the counterfactual performance of executions which IEX prevented without access to IEX’s order data.